The exponential distribution holds a special significance for me. My PhD thesis was all about optical transients, the simplest mathematical models of which are exponential distributions. 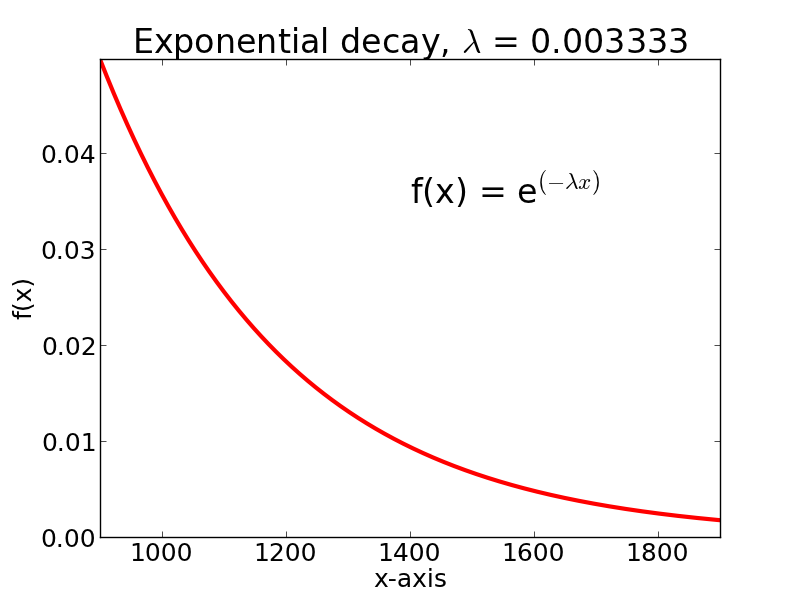 Currently, I work in x-ray science, which is heavily concerned with the depletion of an (x-ray) optical field as it traverses some distribution of matter (both in an object being imaged, and in the detector) - this time the exponential distribution is over space, rather than time, but the mathematics is the same. Any kind of involvement with mathematical science quickly brings us into intimate contact with exponential functions, as these arise left, right, and centre, in the solutions of differential equations. The reason for this is related to the fact that the exponential is the only mathematical function that is its own derivative. This is closely related to a special property of the exponential distribution, known as memorylessness (what will happen next - its rate of change - is entirely governed by the current state). So let's take a quick look into how the exponential distribution comes about, and what its major characteristics are. Imagine a stream of photons incident on some distribution of matter. It's no surprise to learn that some of those photons are going to be absorbed or scattered, so that they non-longer continue on their original path. The number that are scattered will depend on the thickness of the matter that they pass through, which is why, on a foggy day, things that are close to you can be easily seen, things not too far off can be somewhat made out, while objects a bit further away can't be seen at all. We'd like to know exactly what the dependence on distance is. Lets denote as PL(U) the probability (dependent on length, L) that a photon will remain unabsorbed by its surrounding medium. For any infinitessimally thin strip of that medium (whose distance in is L), the probability to be absorbed at that location is the product PL(U) × P(A | U), where P(A | U) is the probability to be absorbed in that strip, given that it was not absorbed in any early strip. This follows from the product rule applied to the necessary conjunction, 'unabsorbed, before now' AND 'absorbed here', required for an absorption to occur at a particular place. The probability P(A | U) is independent of where the photon has been up to now - adding the U after the vertical bar ensures this. There is no physical reason for P(A | U) to depend on the photon's history, and this is the property of memorylessness I mentioned a moment ago. To put it another way, we are dealing with a Markov process, which can be a useful fact to remember. It's easy enough to verify that this function is normalized (e.g. check Eq. 12, for L = ∞). To maintain unit consistency, the units of λ are the inverse of the units of x. If x is distance, in mm, then λ has units mm-1. If x is time, in seconds, then λ is a rate (or frequency) with units s-1. We can visualize the memorylessness of the thing, and appreciate how some of the exponential distribution's spooky symmetry comes about by starting at any point further along the x-axis and advancing along x by a distance of another 1000 units, and expanding the y-axis to fill the same amount of space on the screen. Below, I chose to start at x = 900, near the end of the previous plot. The curve looks identical to before. Note that the numbers on the x- and y-axes are different, but the functional form is the same. It is as if those first 900 units on the x-axis had never happened. 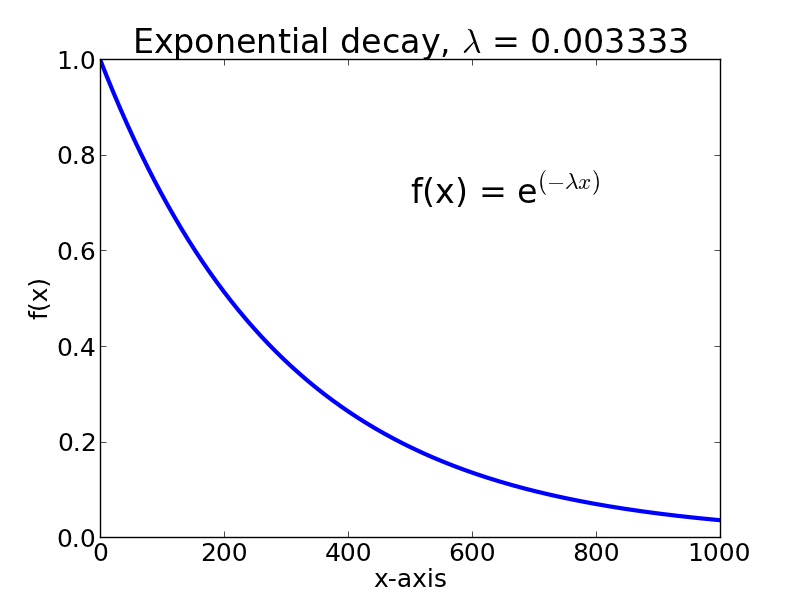 Any two-level, time-invariant decay process is exponential. The photon is a two-level system, it goes from unabsorbed to absorbed, then it's game over, and as long as its environment isn't changing, it exhibits the required temporal symmetry. A radioactive nucleus is a similar two level system - not decayed followed by decayed. Very many other physical systems follow the same pattern. The process is still exponential if there are several decay channels between the two levels of the system. More complex dynamics can be described by various combinations of exponential functions. Beyond photons and atoms, many other phenomena are exponential. Even some human affairs, such as the time that a hospital bed remains occupied, follow this remarkable formula. It is straightforward to see that τ is the expected time it takes for the number of excited atoms to fall to 1/e times the initial number. This particular formula highlights the general difference between the mean and the median: the mean is the centre of mass (depending on the sum of the products of mass times distance), while the median is the point at which the mass to the left equals the mass to the right (depending only on the sum of the masses). Note: we mustn't fall into the trap of thinking that after 2 half lives, all the radioactive nuclei will have decayed. Remember, the process is memoryless - in 2 half lives, the population drops to one quarter, in 3 half lives it drops to one eighth, and so on. Of further interest is that for any continuous parameter restricted to non-negative values, the exponential distribution has the property of maximum entropy.